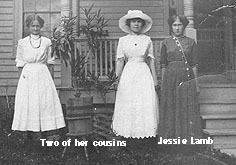 This is a picture of Jessie Lamb before she was married with two of her cousins. Jessie is in the dark dress. This is Doc Lamb one of Jessie's two brothers. This is Andy Lamb, Jessie's other brother.